Andy Murray has thrown his unequivocal support behind the crackdown on time-wasting in tennis because he believes it will turn the sport into even more of a survival of the fittest. The U.S. Open champion was speaking after he eased into the Brisbane International final on Saturday when his opponent Kei Nishikori retired but he does have one issue with the ruling, admitting the 25-second limit is a little too short. The top-seeded Briton and Bulgaria’s Grigor Dimitrov will contest the Brisbane title on Sunday amid widespread controversy over the strict enforcement of a rule that had been virtually ignored for years. Dimitrov will aim to usurp the defending champion after a 6-3 5-7 7-6 triumph against Marcos Baghdatis that was notable for the Cypriot being penalised for a time violation in the deciding tiebreaker. The Association of Tennis Professionals (ATP) is trying to speed up matches and an automatic fault was called against Baghdatis when he exceeded the time limit at 2-2 in the tiebreaker. Baghdatis was clearly agitated by the call at such a crucial juncture and Dimitrov won the decider 7-5 to reach his first tour final and earn a clash with Murray. The Briton made a sluggish start to his semi-final but rallied to lead Nishikori 6-4 2-0 when the Japanese number one withdrew because of a knee injury. 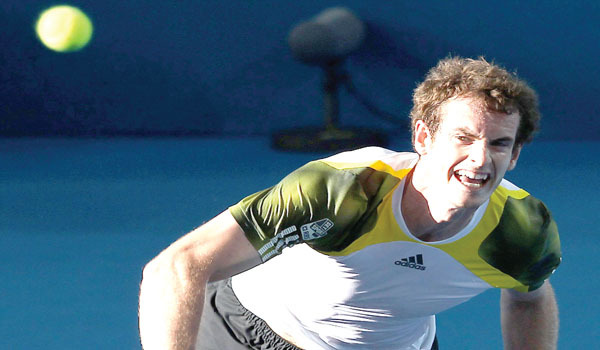 Murray said the crackdown on time wasting had stemmed from Novak Djokovic’s win over Rafael Nadal in their gruelling 2012 Australian Open final that lasted almost six hours. “I’m for them being more strict with the time, but I think they maybe should have increased the time allowed first, because 25 seconds goes by pretty quick,” Murray said. “We were told the reason for them changing the rule is because of the Aussie Open final last year, which I think everyone agrees was a classic match. “Right now, that match is getting shown whenever there is a delay or someone has pulled out or something, so it’s not like the TV hated the match and they’re never going to show it again,” he added. “I also think tennis has changed since the time rule began between points. The rallies are much, much longer, so therefore it takes longer to recover. “I like that there is a time violation in there. I think it’ll be good, but I think starting off with 25 seconds at the beginning was a bit too much, because players just aren’t used to playing at that pace. “It’s a huge advantage for the returner, not for the server, because the returner can just get to the line and just stand there and say he’s ready whereas the server, 99 percent of the players bounce the ball three or four times before their serve. “That’s when guys are getting the penalties, when they’re actually bouncing. I got one the other day whilst I was bouncing a ball. “I like the idea behind it. I just think they could have adjusted the time in between the points a little bit.” The U.S. Open and Olympic champion claimed 30 seconds would have been a more realistic limit, but denied umpires should take into consideration the length of a rally or stage of the match. “I think it’s wrong that people say they have to give a bit of leeway if there is a long point,” Murray added. Dimitrov had no issue with the rule and believed Baghdatis lost rhythm after the umpire’s intervention. “I think it’s good,” he said. “Let’s not forget that the players voted for that, so I guess it’s if they want it to be there, it’s there. It’s kind of their call.” The 21-year-old is contesting his first ATP final at the beginning of what he hopes will be a breakthrough year. Nicknamed ‘Baby Federer’ because of the similarity in style and natural ability to 17-times major winner Roger Federer, the Bulgarian denied the comparison had become a burden.